Automotive Gift Cards – Go From Zero To Hero! Everyone loves receiving gift cards. And you will shoot from zero to hero after you give your loved one the opportunity to have their beloved car touched up and/or restored to its former gleaming glory. Gift cards are the ‘fail-safe’ presents that allow the receiver to purchase something they actually want, but that they couldn’t justify spending money on due to mundane and boring day to day living cost necessities. 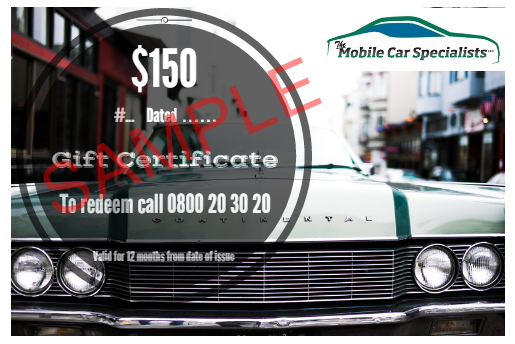 And a gift voucher from The Mobile Car Specialists will furnish you – the giver – with massive kudos for being so discerning in your judgement of their true desires! We believe that any family member or friend who owns a car and takes some level of pride in it, deserves to have it in tip-top condition. So if you know someone like this and feel they might have shuffled their car requirements to the bottom of the ‘must do’ pile, then you should take the bull by the horns and purchase them one of the gift options from below, and watch them squeal with delight as they realise they can now justify that dent repair or paint detailing (cut & polish) they’ve been longing for! Remember, when it comes to buying great pressies.. socks, jocks and chocs are disappointing at best, the real gift of restoring a car will trump the rest! All vouchers are sent electronically and will be emailed with a unique identifying number once payment has been received. They are valid for 12 months from purchase. Simply fill in the form below and we’ll email payment details straight away. As we operate Auckland wide please ensure the recipient lives here.